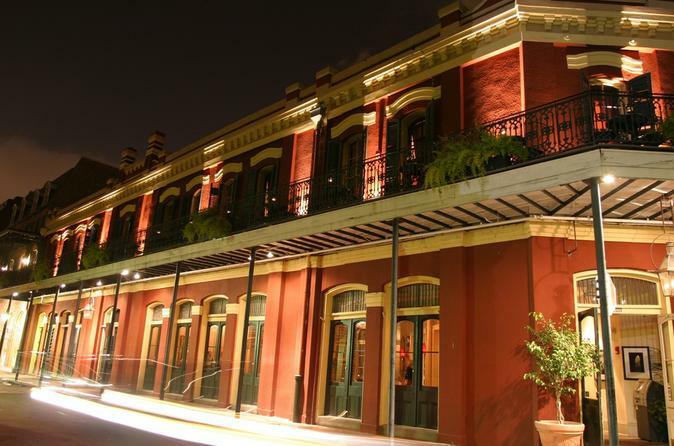 See haunted sites in the French Quarter on this 2-hour ghost tour of New Orleans. Hear ghostly legends and lore from your entertaining guide, who shares eerie tales featured on the History Channel. With its colorful past and unique traditions, it’s no wonder that so many New Orleans’ homes and taverns have been investigated by paranormal investigators! When it rains in the French Quarter of New Orleans, the locals swear that a beautiful voice floats out of the mist. After you hear the story of ‘Bloody’ O'Reilly vs. Pere Dagobert – an 18th-century priest of St Louis Cathedral – you just might hear the singing rain too! Start your ghost tour at Jackson Brewery, where you’ll meet your entertaining guide and set off to various haunted sites. There's no guarantee you will spot a ghost, but you'll see where you're most likely to meet one! Learn about the spirits that inhabit the Bourbon Orleans Hotel – formerly a theater, ballroom, orphanage and convent – where the staff and guests report regular sightings of uninvited guests. Walk to O'Flaherty's Pub and hear the story of several resident ghosts who dislike one another. Be sure to bring your camera. You never know who will want to pose for a picture! Special Offer - Book by September 10, 2018 to save 7% off our previously offered price! - Book Now!